A Silicon controlled Rectifier (SCR) is a semiconductor device which conducts in only one direction. It has three terminals. An anode, a cathode and a gate. Unlike a diode, however, it needs to be switched on by a pulse applied to the gate. 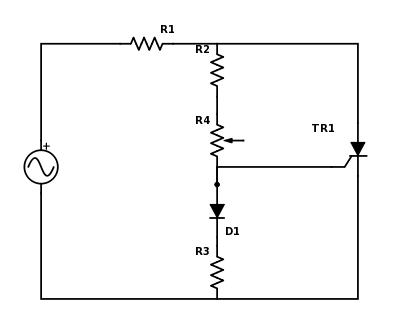 The circuit below shows the method of switching on an SCR using a resistor. The power source is connected across the SCR. The gate voltage is provided by the voltage divider circuit. The variable resistor, R4 is used to control the firing angle.